It's hard -- for me at least -- to get too excited about hard drives. They get bigger, they get faster, and that's about it. But the iStorage diskAshur2 is a little different. This is a 1TB USB 3.1 external hard drive with a twist. It offers hardware-level AES-XTS 256-bit encryption -- so no software is needed -- secured with PIN authentication. 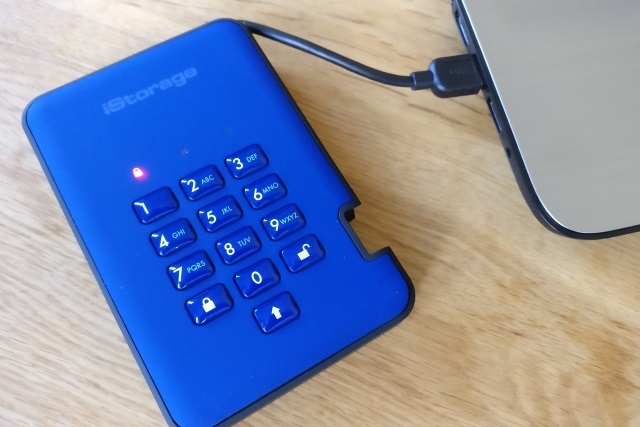 As you can see from the photo, there's a PIN pad built into the drive for easy locking and unlocking, and it's compatible with Windows, macOS and Linux ("it will work on any device with a USB port!"). We've already look at the diskAshur Pro 2, but this diskAshur2 drive is nearly 20 percent cheaper. The primary difference between the Pro drive and this one is the form of encryption that's used. While the diskAshur Pro 2 is "designed to be certified to" FIPS 140-2 Level 3, NCSC CPA, Common Criteria and NLNCSA, in the case of the diskAshur2, it's the lesser, older FIPS PUB 197 validation that's in place. In both instance, however, there's AES-XTS 256-bit hardware encryption protecting data which should be more than enough for most circumstances. FIPS 140-2 Level 3 means that the diskAshur Pro 2's circuit board has a tamper-proof design, but there are still physical protection measures in place with the diskAshur2 for added peace of mind. The protection comes from the built in EDGE (Enhanced Dual Generating Encryption) Technology which protects from "external tamper, bypass laser attacks and fault injections and incorporates active-shield violation technology." There's also security against unauthorized firmware updates, and the onboard processor "reacts to all forms of automated hacking attempts by entering the deadlock frozen state where the device can only restart through a 'Power On' reset procedure." In short, it's secure. But what's it like to use? 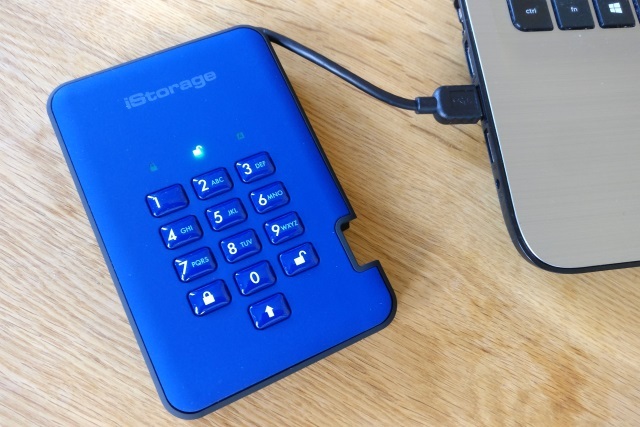 The iStorage diskAshur2 is designed with travelling in mind. It's pretty light at 216g, measures a pocketable 124 x 84 x 19 mm and comes with a hand carry case (the 3TB, 4TB and 5TB models are slightly heavier and larger at 325g and 124 x 84 x 27mm). There's a (short) built in USB 3.1 cable so you don't have to remember to carry one around with you, and the drive is available in a choice of four colors -- Fiery Red, Phantom Black, Racing Green and Ocean Blue. It's IP56 rated for water and dust resistance. What's great about the drive is the incredible ease of use. Encryption usually means having to fiddle around with software, but that's not the case here; everything is built into the drive. The drive is, by default, encrypted. Plug it in, and it remains inaccessible -- and invisible to the computer -- until you enter the necessary PIN and hit the unlock button. From this point, you can manually lock the drive at any time. You can also unplug the drive and it will be automatically locked, or auto-locking will kick in after a predetermined period of inactivity. The lack of software means that it's easy to take the drive from one computer to another, regardless of the operating system it is using. Unlocking the drive is incredibly fast -- much faster than if computer-based software was involved. In terms of performance, this is a 5,400 RPM drive offering read speed of up to 148 MBps and write speeds of up to 140 MBps -- far from earth-shattering, but this is a drive that focuses on security, not performance. As with the diskAshur Pro 2, brute force protection means that the drive will delete its encryption key (rendering data completely inaccessible) after fifteen consecutive incorrect PINs are entered. You can create a PIN of up to 15 digits, so it should be fairly easy to create a non-guessable PIN. For those who need it, there is also the option of using a Self-Destruct PIN to wipe out the encryption key so data cannot be accessed under any circumstances. For peace of mind, there is a two-year warranty covering the device. For the vast majority of people, AES-XTS 256-bit hardware encryption and conforming to FIPS PUB 197 should be more than enough. 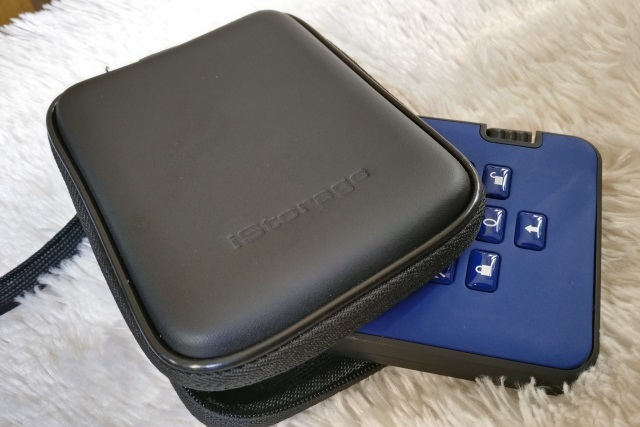 If the relatively high price of the diskAshur Pro 2 was off-putting to you, the diskAshur2 gives you a way to get very much the same product at a pleasingly lower price. 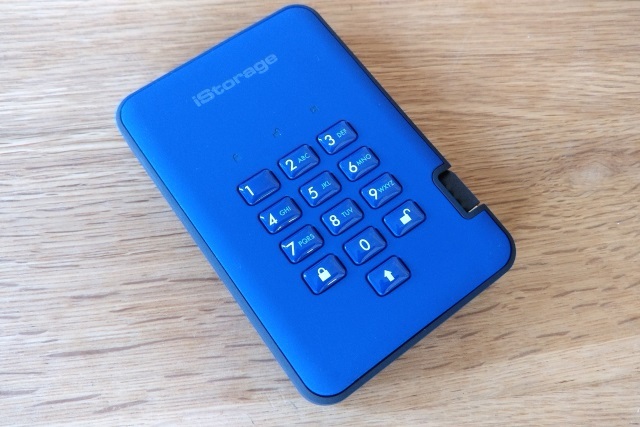 You can find out more and buy a drive direct from iStorage. The 1TB model is priced at £219 (€262).